113 civilians, including 25 children, 3 women, 3 journalists, and 6 paramedics were wounded. Israeli forces wounded 15 Palestinian civilians, including 2 children and a journalist, in the West Bank, and the injury of one of them was reported serious. Israeli forces conducted 81 incursions into Palestinian communities in the West Bank, and 4 limited ones into the Gaza Strip. 70 civilians, including 16 children and a woman, were arrested in the West Bank. 22 of them, including 6 children and a woman, were arrested in Jerusalem. Among those arrested was Ahmed ‘Atoun, a PLC Member, and a whole family in al-Mukaber Mount. Three dwellings and 5 shops were demolished while a plot of land was levelled; all of them in occupied Jerusalem and its suburbs. 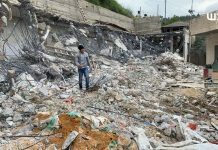 The Israeli Municipality demolished 19 shops that support 60 families in Sho’afat refugee camp. 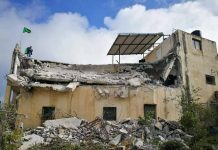 Israeli forces demolished an agricultural room in Douma village, southeast of Nablus. Israeli settlers caused severe damage to an ambulance belonging to the Palestine Crescent Society (PRCS). 7 shooting incidents were reported against the fishing boats in the sea, but no casualties were reported. 103 permanent checkpoints, 112 temporary checkpoints and 14 closed roads obstruct the movement of Palestinian civilians in the West Bank. 4 civilians, including a child and woman, were arrested at the military checkpoints in the West Bank. Israeli violations of international law and international humanitarian law in the oPt continued during the reporting period (14 – 21 November 2018). At approximately 01:00, Israeli force moved into Yatta, south of Hebron, and stationed in Roq’ah neighbourhood. They raided and searched 3 houses belonging to Mohammed Mahmoud al-Najjar, ‘Azzam Khalil Makhamrah and Nafez Mohammed al-‘Amour. The Israeli forces withdrew later from the city. Around the same time, Israeli forces moved into Deir al-Ghusoun village, north of Tulkarm. They raided and searched a house belonging to Bari Zuhair Badran (24) and then arrested him. At approximately 07:00, Israeli forces stationed at the border fence between the Gaza Strip and Israel, north of al-Sefa area, northwest of Beit Lahia in the northern Gaza Strip, arrested Taher Khamis Ahmed Matar (22), from Bloc No. (9) in Jabalia. Taher attempted to sneak into Israel. At approximately 16:00 on the same day evening, Taher’s family informing them that Taher is under the Israeli forces arrest in Ashkelon. Taher’s brother, Mohammed said to PCHR’s fieldworker that the family contacted the International Red Cross, who confirmed that Taher is arrested and wounded to the right hand. Mohammed al-‘Attar (23) with a bullet to the pelvis. As a result, a number of fishermen took him outside the water amidst a state of panic and fear and called an ambulance to transfer him to the hospital. The ambulance arrived on the main road in front of the shore and took Nawaf, who passed away few minutes later after he bled so much. The ambulance then arrived at the Indonesian Hospital in Jabalia refugee camp, where his death was declared. It should be mentioned that the abovementioned group of fishermen who gathered to fish were only amateurs and not registered at the Fishermen’s Syndicate. They were fishing in that area using nets that are only for fishing mullets in its season that coincides this time of the year. Note: During the aforementioned day, Israeli forces conducted (13) incursions in the following areas and no arrests were reported: Ethna, al-Shuyoukh villages and al-‘Arroub refugee camp in Hebron; ‘Anabtah, Beit Led, Safarin, al-Jarushiyah villages, Shuweikah and Artah Suburbs in Tulkarm; ‘Azzoun and Jeet villages in Qalqiliyah; Salfit, Deir Estia village and northwest of the city. At approximately 02:00, Israeli forces moved into Um al-Daliah neighborhood in the southern area in Hebron. They raided and searched a house belonging to ‘Arafat Samir Abu Husein (46) and then arrested him and his son Samir (21). At approximately 03:00, Israeli forces moved into Tubas. They raided and searched a house belonging to Qais Ziyad Amin Sawaftah (20) and then arrested him. At approximately 10:00, Israeli forces moved into Tal village, west of Nablus. They raided and searched several houses after which they arrested 4 children namely Ibrahim ‘Ali al-Saifi (16), ‘Ali Husein ‘Ali al-Saifi (17), Mohammed Mustafa ahmed Saleh Ramadan (17) and Mohammed Hasan Ismail al-Hendi (16). The Israeli forces later released 3 children and kept al-Hendi under arrest. Around the same time, Israeli forces accompanied with a number of military vehicles moved about 100 meters into the east of al-Qararah village, northeast of Khan Younis in the southern Gaza Strip. They leveled lands adjacent to the border fence between the Gaza Strip and Israel and then and redeployed along the border fence. At approximately 12:00, Israeli forces stationed along the border fence between the Gaza Strip and Israel, east of Deir al-Balah in the central Gaza Strip, opened fire at Palestinian shepherds and agricultural lands adjacent to the border fence. the shooting sporadically continued until approximately 18:00. As a result, the farmers were forced to flee fearing for their lives, but no casualties were reported. At approximately 13:00, Israeli forces moved into Beit al-Roush village, west of Dura, southwest of Hebron. They surrounded a 3-story house belonging to Mazen ‘Essa Taha Harbiyat (43) and locked the family members, who were about 3 women and 8 children in the first floor, searched the 3 houses and damaged the house contents. The search continued for about 3 hours as the Israeli soldiers claimed that they were searching for weapons. Before the soldiers withdrew from the house, they confiscated about half a million shekels, which are the salaries of a group of workers as Mazen works in contracting in Israel. The Israeli soldiers arrested Mazen and after 4 hours, they released him, but kept the confiscated money until they prove the source of the money. Note: During the aforementioned day, Israeli forces conducted (8) incursions in the following areas and no arrests were reported: Beit Ummer, Beit ‘Awa village and al-Fawar refugee camp in Hebron; Tulkarm, Shuweikah Suburb, Deir al-Ghusoun and al-Jarushiyah villages, north of the city; and Salfit. At approximately 01:00, Israeli forces moved into Shuweikah Suburb, north of Tulkarm. They raided and searched 2 houses belonging to Majd ‘Ala’a Akabriyah (20) and Lafi Mohammed Lafi Na’alwah (21) and then arrested them. At approximately 02:00, Israeli forces moved into Bier al-Basha village, south of Jenin. They raided and searched a house belonging to Husein Ghawadrah. The soldiers took photos of the second floor and took its measurements. It should be noted that Husein is sentenced to life imprisonment. Note: During the aforementioned day, Israeli forces conducted (3) incursions in the following areas and no arrests were reported: Halhoul and al-Mawreq village in Hebron; and Sebastiyah village, northwest of Nablus. At approximately 07:20, Israeli forces accompanied with 6 military vehicles moved about 100 meters near al-Namer Gate, east of Deir al-Balah in the Central Gaza Strip. They leveled lands adjacent to the border fence between the Gaza Strip and Israel. Few hours later, the Israeli forces redeployed along the border fence. At approximately 08:00, Israeli soldiers stationed along the border fence between the Gaza Strip and Israel, east of al-Buraij, opened fire at a 28-year-old young man while he was on Jakar Street, which is 250 meters away from the border fence. As a result, the young man was hit with a live bullet to lower limbs. At approximately 10:00, Israeli soldiers stationed at the military point in al-Safafir area and secure “Yitzhar“ settlement, south of Nablus. Dozens of Palestinian young men, who carried olive trees to plant them in the lands that are threatened of confiscation. Meanwhile, dozens of young men gathered and threw stones and empty bottles at Israeli soldiers, who fired live and rubber bullets and tear gas canisters at them. As a result, 5 civilians, including a child, were wounded. Three of them were hit with live bullets to the lower limbs and one civilian was hit with a rubber bullet to the shoulder and the child was hit with a tear gas canister to the head. The Israeli forces also targeted an ambulance with a registration plate No. 675392 belonging to Palestine Red Crescent Society (PRCS) in Nablus with a rubber bullet that hit the front glass. The ambulance was driven by Mahmoud al-Az’ar (40), who is accompanied with the ambulance officer, Redwan Abu Hamdan (40). Eyewitnesses said to PCHR’s fieldworker that the Israeli soldiers fired sound bombs and tear gas canisters between houses. As a result, family members of Anas Shaher Abdul Hafith Shehadah suffered tear gas inhalation after a tear gas canister fell in their house. They were evacuated from the house and received medical treatment on the spot. Note: During the aforementioned day, Israeli forces conducted (3) incursions in the following areas and no arrests were reported: Nuba and al-Burj villages in Hebron; Howarah village, south of Nablus. At approximately 01:00, Israeli forces moved into al-Sahal Street in Beit Jala. They raided and searched a house belonging to Malek ‘Emad Slamah (22) and then arrested him. At approximately 02:00, Israeli forces moved into ‘Aydah refugee camp, north Bethlehem. They raided and searched a house belonging to Dawoud Mahmoud al-Khatib (23) and then arrested him. At approximately 03:00, Israeli forces moved into the Hendazah area, east of Bethlehem. They raided and searched a house belonging to Mahmoud Yusuf ‘Obayat (22) and then arrested him. At approximately 10:00, Israeli forces stationed at Military Checkpoint (160) fired sound bombs and tear gas canisters at students of Hebron Elementary School in Tareq Bin Ziyad area while they were at the school yard. As a result, many students suffered tear gas inhalation and received medical treatment on the spot. The Israeli soldiers claimed that the students threw stones at the abovementioned checkpoint. 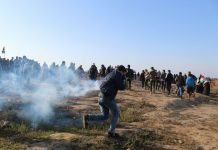 At approximately 08:30, Israeli soldiers stationed along the border fence between the Gaza Strip and Israel, opened fire at agricultural lands, east of Juhor al-Deek village, the shooting sporadically continued for 50 minutes, but no casualties were reported. In the evening hours, Israeli soldiers established a sudden military checkpoint at the main entrance to Deir Abu Mash’al village, northwest of Ramallah, opened fire at a car driven by 5 Palestinian civilians from the abovementioned village. As a result, 3 of them were wounded. Doctors classified a civilian’s injury as serious. According to PCHR’s investigations and statements of eyewitnesses, at approximately 23:30, Mahmoud Wajih Zahran (20) and 4 of his friends, from Deir Abu Mash’al village, northwest of Ramallah was driving a car with Israeli registration plate and moving to ‘Aboud village nearby. Mahmoud arrived at the main intersection of the village on (64) Settlement Street where he was surprised with an Israeli vehicle and a number of soldiers, who established a temporary checkpoint, 300 meters away from the car. Mahmoud immediately turned his car back to return. Meanwhile, the soldiers order Mahmoud to stop his car after they suspected the car, but Mahmoud drove fast and left the village. The soldiers then heavily opened fire at the car targeting the rear glass and the car side, which led to smashing the door. As a result, Mahmoud was hit with a live bullet to the left thigh and 2 of his friends were wounded. They were admitted to Yasser Arafat Hospital in Salfit to receive medical treatment. Doctors classified Mahmoud’s injury as serious and then transferred to En-Najah National University in Nablus to carry out a surgery for Mahmoud. Note: During the aforementioned day, Israeli forces conducted (4) incursions in the following areas and no arrests were reported: Hebron, Yatta, Beit al-Roush al-Tahta village, and Deir al-Balah. At approximately 01:20, Israeli forces moved into Nablus and Balatah refugee camp, east of the city. They raided and searched several houses and then arrested 3 civilians namely: Pharmacist Nasser Yusuf Shraim (41), a lecturer at En-Najah National University and brother in law of Ashraf Na’alwah, who is accused by the Israeli forces to carry out shooting attack in Barkan Industrial area, west of Salfit; and Mahmoud Faisal Qawariq (22), a student at the Faculty of Engineering at En-Najah National University; and ‘Ezz Eden Mohammed Zuhdi Marshoud (23). At approximately 01:30, Israeli forces moved into Hebron. They raided and searched a house belonging to Islam ‘Adnan Mojahed (20) and then arrested him. At approximately 02:00, Israeli forces moved into Jenin refugee camp, west of Jenin. They raided and searched a number of houses and then arrested Jihad Fawzi Taleb (21) and Majd Ayman Mahmoud Barakat (22). At approximately 02:30, Israeli forces moved into Qarawet Bani Hassan village, northwest of Salfit. They raided and searched houses belonging to Abdullah Mahmoud ‘Asi (26), Yusuf Mahmoud ‘Asi (22) and Laith Abdullah Mar’ie (20) and then arrested them. At approximately 03:00, Israeli forces moved into Qalqiliyah. They raided and searched 2 houses belonging to Mahmoud Nabil Qashmar (25) and Sa’ed bilal Suweilem (26) and then arrested them. At approximately 04:00, Israeli forces accompanied with 2 military vehicles moved into al-Mazra’ah al-Gharbiyah village, northwest of Ramallah. They raided and searched 2 houses belonging to Yahiya ‘Aqel Rabea’a (21) and Basel Abdullah Ladadwah (19) and then arrested them. Around the same time, Israeli forces moved into Deir Abu Mash’al village, northwest of Ramallah. They raided and searched a house belonging to Omer Mahmoud Rabea’a (25) and then arrested him. At approximately 04:30, Israeli gunboats stationed offshore, adjacent to al-Waha resort, northwest of Beit Lahia in the northern Gaza Strip, sporadically opened fire at Palestinian fishing boats sailing within 4 nautical miles and chased them. the shooting recurred in the abovementioned area at approximately 08:55 on the same day. As a result, the fishermen were forced to flee fearing for their lives, but neither casualties nor material damage was reported. At approximately 06:50, following the withdrawal of Israeli settlers from the outskirts of ‘Ourif village, southeast of Nablus, Israeli forces moved into the abovementioned village to carry out arrest campaigns. They raided and searched sever houses after which they arrested Salah Saleh Mohammed al-Safadi (15) and Rani Moneer Suleiman al-Nuri (18). At approximately 02:00 on the next day, the Israeli forces released al-Safadi at Howarah checkpoint, south of Nablus and handed him to the Palestinian Military Liaison that moved him to Nablus City Police. The police transferred al-Safadi to Rafidiya Governmental hospital because he suffered pain at the left hand and bruises to the back and head as Israeli forces attacked him in Rani’s house. Doctors found out that al-Safadi suffered fracture in the left hand. He received medical treatment and then the police moved him to their office in Nablus. After that, al-Safadi’s family came and took their son with them. At approximately 08:00, Israeli forces accompanied with 4 military vehicles moved about 100 meters into the south of “Zikim” Military Base, adjacent to the northern coastal line borders, northwest of Beit Lahia in the northern Gaza Strip. They leveled lands amidst sporadically opening fire.at approximately 09:30, the Israeli forces redeployed along the border fence between the Gaza Strip and Israel, and no casualties were reported. At approximately 19:00, Israeli forces moved into ‘Aslah village, south of Qalqiliyah. They raided and searched a house belonging to Hamzah Abdul Halim Husein (56) and then arrested him and his son Qusai (26). Note: During the aforementioned day, Israeli forces conducted (8) incursions in the following areas and no arrests were reported: Halhoul, Deir Estia and Sa’ir village in Hebron; Tulkarm and ‘Anabtah village, east of the city; ‘Azzoun and Joyous villages, east of Qalqiliyah, Bruqin village, west of Salfit. At approximately 01:00, Israeli forces moved into al-Fawar refugee camp, south of Hebron. They raided and searched a house belonging to Mohammed Mo’ati Ghatashah (24) and then arrested him. At approximately 01:20, Israeli forces moved into Kufor Qaddoum village, northeast of Qalqiliyah. They raided and searched several houses belonging to Khalid Murad Eshtiwi (13), ‘Awad Mansour Abdul Latif ‘Obaid (17), ‘Emad Ahmed Eshtiwi (26) and then arrested them. At approximately 02:30, Israeli forces moved into Beit Ummer village, north of Hebron, and stationed near the village Mosque in the central Gaza Strip. they raided and searched a house belonging to Ibrahim Hmaid Abu Maria (40) and then withdrew from the village. At approximately 02:00, Israeli forces moved into al-Duheishah refugee camp, south of Bethlehem, using a civil bus. They stationed near Phoenix Charitable Society in the camp. They raided and searched a number of houses. Meanwhile, dozens of Palestinian young men and children gathered near the area and threw stones and empty bottles at Israeli soldiers. The soldiers fired live and rubber bullets at them. as a result, a young man was hit with a live bullet to the foot. At approximately 04:00, clashes between the Palestinian young men and the Israeli soldiers and reached al-Dawhah village. Large Israeli forces moved into the abovementioned village. They raided and searched several houses and then arrested Omer Mousa Qawar (17) after they beat heavily beat him. At approximately 06:15, Israeli gunboats stationed offshore, adjacent to al-Waha resort, north of Beit Lahia in the northern Gaza Strip, heavily opened fire at Palestinian fishing boats sailing within 4 nautical miles and then chased them. The shooting recurred in the above-mentioned area at approximately 14:38 and 18:25 on the same day. As a result, the fishermen were forced to flee fearing for their lives, but neither casualties nor material damage was reported. At approximately 07:30, Israeli forces accompanied with 6 military vehicles moved about 100 meters into the east of al-Maghazi, west of the border fence between the Gaza Strip and Israel. They leveled lands adjacent to the border fence and then headed into the northeast of al-Buraij. The incursion continued until approximately 12:00. The Israeli forces redeployed along the border fence. Note: During the aforementioned day, Israeli forces conducted (3) incursions in the following areas and no arrests were reported: Sa’ir, Beit ‘Ainoun villages and al-Fawar refugee camp in Hebron. Around the same time, Israeli forces moved into Surif village, west of Hebron, and stationed in al-Matinah neighborhood. They raided and searched a house belonging to Fadi Ibrahim Ghuneimat (38) and then arrested him. At approximately 02:30, Israeli forces moved into Yatta, south of Hebron and stationed in al-Karmel neighborhood. They raided and searched a house belonging to Shehadah Mohammed Da’ajnah (50) and then arrested him. At approximately 03:00, Israeli forces moved into Beit Fajjar village, south of Bethlehem. They raided and searched a number of houses and then arrested Amir Murad Taqatqah (16) and Mohammed ‘Adel Taqatqah (16). It should be noted that Amir had a surgery 2 days ago and his health condition is still unstable. At approximately 04:30, Israeli forces moved into al-Birah and stationed in al-Shurfah area in the center of the city. They raided and searched a house belonging to Ahmed ‘Atoun (50), Member of the Palestinian Legislative Council representing the Change and Reform Bloc, and the arrested him. It should be noted that ‘Atoun was forcibly deported by the Israeli forces from Jerusalem to Ramallah on 06 December 2011, and arrested more than once. Around the same time, Israeli forces moved into al-Am’ari refugee camp, south of Ramallah. They raided and searched a house belonging to Wajdi Abu Samrah (26) and then arrested him. Around the same time, Israeli forces moved into Kufor Malek village, northeast of Ramallah. They raided and searched 2 houses belonging Jihad Fahed Ba’irat (26) and Oseid Ja’far Jamil (21) and then arrested them. At approximately 07:00, Israeli gunboats stationed offshore, adjacent to al-Sudaniyah area, west of Jabalia in the northern Gaza Strip, heavily opened fire at Palestinian fishing boats sailing within 4 nautical miles and chased them. As a result the fishermen were forced to flee fearing for their lives, but neither casualties nor material damage was reported. Note: During the aforementioned day, Israeli forces conducted (5) incursions in the following areas and no arrests were reported: Nablus, Sa’ir, Beit Ummer, al-Majd and Beit al-Roush villages in Hebron. On Wednesday, 14 November 2018, Israeli forces arrested Ma’moun Jameel (16), from ‘Amouriyia village, south of Nablus, while returning from al-Laban and al-Sawiyia Secondary School. At approximately 15:00 on Monday, 19 November 2018, Israeli forces stationed at Qalandia military checkpoint, north of occupied East Jerusalem, arrested Iftikar Jamal Mohamed ‘Abed al-Fattah Kmail (25), from Qabatiyia village, south of Jenin, claiming that she had a knife. Iftikar’s father said that his daughter was in a family trip to al-Aqsa Mosque in Jerusalem and she had some food, including fruit, so she needed a knife to slice them. He added that when his daughter approached the checkpoint, she was afraid and hid the knife .When the soldiers found the knife, they accused her of intending to carry out a stabbing attack at the checkpoint. It should be noted that Iftikar is the mother of 3 children and was intending to perform prayers at al-Aqsa Mosque.